Art images on the Web represent one of the first and last frontiers in terms of pools of knowledge: millions of historic art images served and more to come. Guides to art resources are legion. Almost every university and college that teaches art or art history seems to devote some portion of its faculty or departmental Web site to art resources on the Web. Academic libraries, especially those connected to art galleries or art museums, often maintain subject guides to art and art history. Projects initiated by art librarian members of the Visual Resources Association (VRA) [http://www.vraweb.org], the Art Libraries Society of North America (ARLIS) [http://www.arlisna.org/], and ARLIS organizations around the world have implemented visual databases comprised of cataloged artwork accompanied by a digital image. Both the VRA and ARLIS/NA maintain sites describing members' online image databases [http://www.vraweb.org/memberwebsites.htm] [http://www.chatham.edu/users/staff/dnolting/images.html]. In cooperation with the IFLA Section of Art Libraries, ARLIS/NA and other art library organizations help establish and maintain the International Directory of Art Libraries [http://artlibrary.vassar.edu/ifla-idal/]. The directory, however, specifically omits "slide, photograph, and other exclusively visual resource collections." Drawing upon networking technology, newer standards such as OAI (Open Archives Initiative) and specialized metadata vocabularies and rules developed by or with the support of the Getty Research Institute, the Web universe of digital art resources shows no sign of slowing down or peaking. In late May 2004, for example, Visual Collections: Images of Art, History and Culture [http://www.davidrumsey.com/collections/] from David Rumsey and Cartography Associates was unveiled. Many countries struggle with copyright issues when it comes to displaying art reproductions on the Web. For example, the Swiss site, Arte24 [http://www.arte24.ch], notes," The images of art and cultural objects from Swiss museums are not available at the moment due to copyright problems." Academic institutions attempting to comply with the complexities of copyright law take a variety of approaches to the display of digitized art images, ranging from campus-only or proxy server access by authorized faculty, staff, and students to full public access. 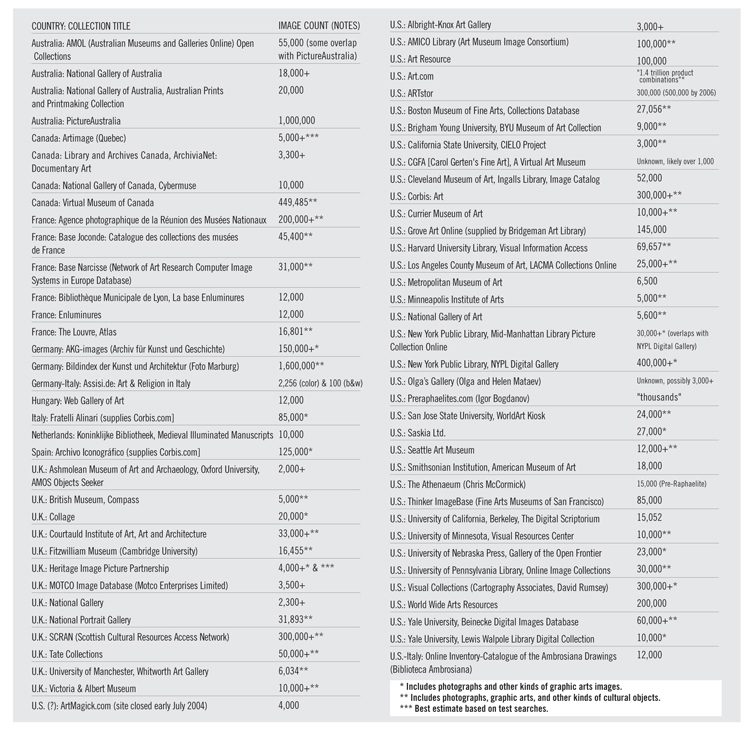 Some academic museums and galleries provide thumbnail catalogs for general public access, following an approach taken by the AMICO Consortium. Cultural institutions throughout the world commonly use the practice of digital watermarking of images. For current information on art image copyright, mainly from a U.S. perspective, see Copyright & Art Issues [http://uoregon.edu/~csundt/copyweb/], compiled by Christine L. Sundt, visual resources curator, University of Oregon. You can find other perspectives and links on copyright and art images through the VRA Intellectual Property Rights Committee [http://www.arthist.umn.edu/slides/IPR] and IFLANET's (International Federation of Library Associations and Institutions) Information Policy: Copyright and Intellectual Property [http://www.ifla.org/II/cpyright.htm]. My limited exploration of art image databases did not include some of the catalog raisonné and art census projects, undoubtedly significant to art historians, such as the subscription-based and Internet-accessible Census of Antique Works of Art and Architecture Known to the Renaissance [http://www.dyabola.de/en/projects/detail/cen.htm]. I will focus on publicly available, though not necessarily always authoritative, online art image sites. I passed up standard, subscription-based reference works such as the Grove Art Online (based on the 34-volume Dictionary of Art; Oxford University Press, 1996) [http://www.groveart.com] and Princeton University's Index of Christian Art [http://ica.princeton.edu]. At least one contemporary fine arts gateway, Artnet.com [http://www.artnet.com], provides free, licensed access to selected Grove Art Online content, including historical art, in the form of Artists' Biographies, Materials and Techniques, and Styles and Movements. I will chiefly deal with digitized, original historical Western (European and North American) art images of any nonphotographic medium prior to the 20th century found in cultural institutions or on private sites. I've ignored commercial art and illustration, as well as architectural images. My intent was to create a kind of virtual "grand tour" of Western art, mainly from English-language sources, and to survey and sample the largest and best historical art from institutions and private sites in North America and Europe. I consulted many art history subject guides and gateways, relying chiefly on those compiled by art historians or art librarians. 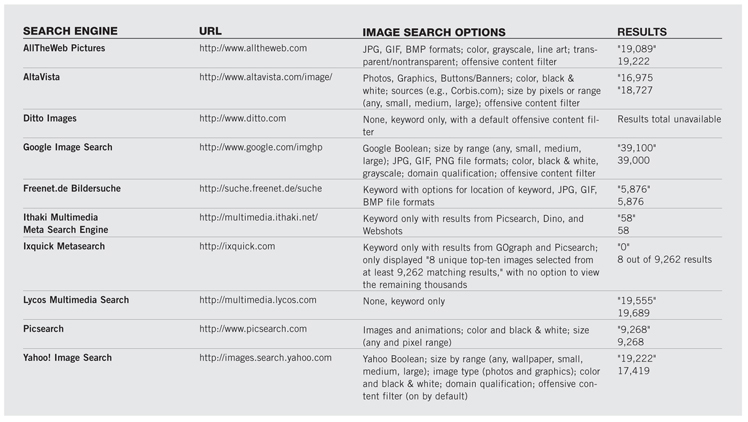 Due to space limitations, I've had to leave out many other kinds of resources, some of which I've summarized in the sidebar at left, "It's All Art: Other Search Spots for Online Art Images." Resource guides are particularly useful as starting points, describing content and organization, site maintenance, selectiveness, search tools, and sometimes the qualifications of site editors. Most of these guides refer to one another. Link rot (dead links) may affect your assessment of these sites. I've arranged them by their origin (academic or librarian, commercial, and private) and their focus on museums or art galleries. 	For ease of use and organization, look first at The Digital Librarian by Margaret Vail Anderson [http://www.digital-librarian.com], particularly in the Images and the Art pages. 	Sweet Briar College (Virginia) art history professor Chris Witcombe's Art History Resources on the Web [http://witcombe.sbc.edu/ARTHLinks.html], "online since October 24, 1995," will lead you through the time, place, and types of artistic expression in a well-developed, clear taxonomy. It's one of the most referenced art history guides I came across. Even with a basic, but good navigational interface, I found the lack of a search engine for such a comprehensive and near-decade-old resource an odd omission. 	The University of Michigan's Mother of All Art and Art History Links Page [http://www.art-design.umich.edu/mother/] sports a top-level section titled Image Collections and Online Art. All the pages of this guide contain annotated links organized into categories relevant to the section topic. 	At Boston College, Jeffery Howe's Art on the Web [http://www.bc.edu/bc_org/avp/cas/fnart/Artweb.html] boasts more than 1,200 art and architecture links, including a section devoted to Image Collections. 	The University of California, Davis, University Library's Art and Art History guide [http://www.lib.ucdavis.edu/hss/art/AAHIndex.htm] offers a well-rounded set of Selected Internet Resources in Art and Art History arranged in four broad categories. 	The Art History Webmasters Association des webmestres en histoire de l'artthat (AHWA-AWHA) [http://www.unites.uqam.ca/AHWA/] was founded by Canadian art history Professor Robert Derome, Université du Québec à Montréal, in 1997. Although the AHWA-AWHA disbanded in 2003, Professor Derome continues to maintain the Index of Art History Departments' Websites Around the World [http://www.unites.uqam.ca/dhistart/]. Other academic-related sites that will help you find art image databases include ARTHIST, the H-NET Information Network for Art History [http://www.arthist.net]; and links to the Kunstgeschichte: Institut & Verbände weltweit (Art History: Institutes and Associations Around the World) [http://www.khist.unizh.ch/KgInstis.html] compiled by Dr. Thomas Freivogel, Kunsthistorisches Institut der Universität Zürich, Switzerland. 	Alan Liu and his team at the University of California, Santa Barbara, weave a comfortable pile of resources in the Voice of the Shuttle: Art & Art History section [http://vos.ucsb.edu/browse.asp?id=2707]. Though the subsection "Image, Slide, Print, Clip Art Resources" is rather threadbare, the General Art Resources at the beginning does lead to art image databases. 	Always a useful starting point, the venerable and decade-old Infomine: Scholarly Internet Resource Collections [http://infomine.ucr.edu], University of California, Riverside, covers the Visual & Performing Arts. A keyword search for "art" in every indexed field except Author revealed 1,656 expert- and robot-selected resources (some relate to photography and the non-visual arts). 	The map-based graphic index is a great touch in Ramon Soler's well-organized, Spanish-language international guide, Recursos a internet d'art i arquitectura (Art and Architecture Internet Resources) [http://hipatia.uab.es/internart/], hosted by the Universitat Autònoma de Barcelona. 	Uppsala University Library's Agora: A Gateway to Online Resources in the Arts and Humanities [http://agora.ub.uu.se] targets the Swedish academic community, and volunteer editors from various institutions review link submissions. Most of the 2,000+ resources (not all relating to art) are publicly available. Although the site interface is bilingual (English and Swedish), many of the resource descriptions are in Swedish or other non-English languages. 	Created by George P. Landow, professor of English and art history, Brown University, The Victorian Web's Visual Arts section [http://www.victorianweb.org/art/artov.html] gave an excellent sense of what exists covering "The Arts in Victorian Britain" for the two-thirds of the 19th century when Queen Victoria ruled. Comparable guides to earlier centuries with sections on art include Jack Lynch's Eighteenth Century Resources (Rutgers University) [http://andromeda.rutgers.edu/~jlynch/18th/]; the Luminarium (Anniina Jokinen) [http://www.luminarium.org], for the Medieval, Renaissance, and 17th-century eras (look in the Resources section of each period for links to art); The Labyrinth: Resources for Medieval Studies (Georgetown University) [http://labyrinth.georgetown.edu]; and NetSERF: The Internet Connection for Medieval Resources (Beau A.C. Harbin, Catholic University of America) [http://www.netserf.org or http://netserf.cua.edu]. 	Art.com [http://www.art.com], once known as Allwall.com and founded in 1995 by then-young entrepreneurs Joshua Chodniewicz and Michael Marston, bought its name and assets from Getty Images in 2001. You can search or browse through a massive collection  "over 1.4 trillion product combinations"  of historic and contemporary art reproductions. The May 2004 American Business Awards (the Stevies) honored Art.com as the best e-commerce site. 	World Wide Arts Resources (also known as AbsoluteArts.com) [http://wwar.com], based in Ohio and started in 1995, claims to be "the largest arts site on the World Wide Web." The site offers free access to "over 80,000 works by over 10,000 artists from around the world." Its Art History database, keyword searchable or browsable by artist name, claims to offer more than 200,000 images from cultural institutions around the world and to cover over 22,000 artists. In addition to online image links to specific museum collections for the historical artists, you may also find links on the same page to news stories, "related sites," and URLs for "Metasearch Website Matches," that is, search engine results based on the artist's name. Like many other catalogs, watch out for name authority issues in the name index, for example, Renoir, Auguste (64 museum images) and Renoir-Pierre, Auguste. 	Traditional Fine Arts Organization, Inc., publishes Resource Library Magazine America's Magazine for Representational Art [http://www.tfaoi.com/resourc.htm], an excellent background tool that includes "thousands of [free, extensively indexed and hyperlinked] RLM illustrated articles and scholarly essays on American art published in HTML format since 1997," along with illustrated profiles of historical American art collections. 	Canadian John Malyon, an IT professional, established Artcyclopedia, the Fine Art Search Engine [http://www.artcyclopedia.com] in 1999. Offering access to "125,000 great works of art" (historic and contemporary) through direct searches or site browsing, Artcyclopedia was one of 2001's Best Free Reference Web Sites awarded the American Library Association's RUSA Machine-Assisted Reference Section (MARS). 	Insecula, l'encyclopédie des arts et de l'architecture [http://www.insecula.com], created by artist Antoine Kuipers (b. 1951, Paris), offers keyword searches to "museums, places, works," or to artists. It has in-depth entries for individual artists (Vincent van Gogh in particular) and museums, as well as linking to individual artworks. The section devoted to the Louvre contains 10,570 items (I assume this means pieces of art). Although Insecula offers a choice of French or English, all the entries I viewed were in French with a smattering of English. 	The Virtual Library museums pages (VLmp), sponsored by the International Council of Museums, contains a section on Art Galleries, maintained by British computing professor Jonathan Bowen (London South Bank University). Besides a well-rounded selection of major art museums and galleries around the world, you should enjoy exploring the list of "Other guides." 	ArtAtlas [http://artatlas.com], "the database of art gallery contact informations" (sic), nominally confines its entries to basic contact information, including a gallery Web site if it exists. You can search for a gallery by name, city, or artist. 	MuseumStuff.com [http://www.museumstuff.com] has a database containing over 20,000 museum-related resources. Select the big button labeled Art to go to the art directory. Many of the links point to other commercial sites, but this is a basic, point-and-click guide to art topics and selected artists. The artist-related links are not comprehensive; for example, I was surprised not to see The Rossetti Archive on the page for Dante Gabriel Rossetti. 	Aiming to provide information about every museum in the world, the MuseumNetwork.com's Musée guide [http://www.musee-online.org] links to more than 37,000 museums. Like MuseumStuff.com, it has an Art & Design category or you can use the advanced search to find an art museum. 	While Euromuse.net [http://www.euromuse.net], the "official network of European art and cultural history museums," focuses on exhibition activities, the Resources page links to several databases with art history information such as the Lost Art Internet Database and many virtual exhibits and special presentations using artwork. You should also investigate Euroclio.net [http://www.euroclio.net], "the gateway to museums and history in Europe," for links to historical museums throughout the European Union. Launched in July 2004 to serve nonprofit institutions in the U.S., ARTstor [http://www.artstor.org] is funded by the Andrew W. Mellon Foundation and modeled on the highly successful "scholarly journal archive" JSTOR project [http://www.jstor.org]. At launch, it delivered around 300,000 images along with software tools. Operating as an independent non-profit itself since January 2004, according to the FAQ, "Like JSTOR, ARTstor will therefore charge institutional licensing fees to defray some part of ARTstor's ongoing operating costs. Ongoing development of ARTstor collections will be funded in other ways." Development plans include collection growth to 500,000 images by 2006. The ARTstor Charter Collection, in testing since 2003, contains a well-rounded sampling of art and architecture from European and Asian traditions. resources/art_collection/index.html] maintains a free catalog to its permanent collection, with 1,300 downloadable, mid-resolution JPG images or about 10 percent of the collection. BAMPFA and the California Digital Library also worked with California museums and archives on the Museums and the Online Archive of California (MOAC) [http://www.bampfa.berkeley.edu/moac/ and via the California Digital Library, http://www.cdlib.org/hlp/directory/moac.html] project, which encompasses, according to the CDL page, "77,000 images from 11 California museums." The image collections cover the entire Pacific Northwest, including Alaska, and also the Pacific Ocean (Hawaii) and Mexico. The Perseus Digital Library [http://www.perseus.tufts.edu] at Tufts University, edited by Gregory Crane in the department of classics, covers the Greco-Roman Classical world, as well as the European Renaissance, and a few other unrelated topics such as 19th-century London and parts of the U.S. Although the site emphasizes classical texts, you'll also discover a large visual repository (nearly 60,000 images as of June 30, 2004) from institutions and individual researchers around the world relating to ancient Greece and Rome. Through the Art & Archaeology Browser tool you can click through pre-defined categories to view images and detailed records relating to architecture, sculpture, vases, coins, gems, and sites. You can also browse or search individual object art and architecture catalogs. An outstanding regional example of a public, multi-institutional database, the Five College Museums / Historic Deerfield Collections Database [http://museums.fivecolleges.edu/III/index.htm] contains descriptions of over 60,000 objects accompanied by thumbnail images. California State University's WorldArt Kiosk [http://worldart.sjsu.edu], hosted at San Jose State University, offers over 35,000 art images searchable by keyword, browsable through various topic categories or "portfolios" which represent groupings of works by controlled vocabulary. Members of the university community can also create their own portfolio views for others to examine. LUCI (Library of University of California Images) [http://vrc.ucr.edu/luci/index.html] features digitized or digital photographs by faculty or staff from several campuses relating to Greek, Roman, and California art and architecture. html/research/digital_collection.html] contains 10,000+ online images from a 13,000+ collection of "English caricatures and political satirical prints from the late-17th through the mid-19th centuries." You can search only by keyword or call number through the library's own interface, or by using the Beinecke Rare Book and Manuscript Library: Digital Collections Cross Collection Search [http://beinecke.library.yale.edu/dl_crosscollex/]. The Beinecke Rare Book and Manuscript Library offers its own online images, over 60,000 from its photo negative file and other sources. Although an outstanding accomplishment, Harvard University Library's Visual Information Access [http://via.harvard.edu] has one serious limitation for art image research. It doesn't allow searching by the format of the original item. When I selected the option "Limit search to records that have digital images," the system offered 69,657 records, not all of which had thumbnails for copyright reasons and not all of which represent artwork. By further limiting a search to a specific Harvard repository or using keywords that represent art-related vocabulary, you can limit search results, but format information would work better. Some academic institutions such as the University of Pennsylvania Library's Online Image Collections [http://imagesvr.library.upenn.edu/i/image/all/]  30,000 online images  and the University of Minnesota's Visual Resources Center [http://fmdb.cla.umn.edu/vrc_web/default.htm]  10,000 online images  adopt the approach used by commercial agencies and provide thumbnail access to their online art images. The University of Nebraska Press' Gallery of the Open Frontier [http://gallery.unl.edu], "an online resource drawn initially from the primary collections of the National Archives," contains over 23,000 searchable photographs and artwork (chiefly photographs of drawings and paintings). The images document the continental U.S. west of the Mississippi River and depict events between the Louisiana Purchase (1803) and 1917. Mary Ann Sullivan's Digital Imaging Project (Bluffton College) [http://www.bluffton.edu/~sullivanm/] features more than 10,000 images of sculpture and architecture taken at various sites around the world and dating back to prehistory. Although there's no search index, she's indexed the photographs by artist, site name, and time period, making it easy and quick to find individual images. You can download the JPG images for personal use only. On a smaller scale, the University of Utah's Images of Art and Architecture [http://www2.art.utah.edu:81/index.html] database contains around 4,000 "digitized reproductions of works of art and architecture ranging from the period before written history through the 20th century." In the face of larger, better-funded, and more technologically advanced projects aimed at the educational market such as ARTstor and the AMICO Library, Allan T. Kohl's personal, nonprofit project, Art Images for College Teaching [http://arthist.cla.umn.edu/aict/html/index.html], may provide welcome relief and content for institutions that can't afford licensing fees, but need access to good art, including images of architecture. Unfortunately, the lack of a search engine makes it hard to search for specific images. The metadata for each image includes references to an appearance in one or more textbooks. While it's relatively simple to track down publicly funded art galleries around the world, Web resource guides may not always indicate the presence of a digital image database. The following are some of the finest and largest online art image databases you can access for free. Image content, however, varies from thumbnails to high-resolution and ultra-magnified images. Each database (catalog) has a minimum of 2,000 digitized images. Based in the U.S., the best-known and one of the largest examples of an international cooperative of public museums and galleries, the Art Museum Image Consortium (also known as the AMICO Library) [http://www.amico.org], founded by the Art Museum Network [http://www.amn.org], features a publicly accessible thumbnail image database of more than 100,000 works of art. Library Journal chose AMICO as a 2003 Best Reference site. The following represents just a small sampling of U.S. public galleries, art museums, and other cultural institutions, along with a few private and commercial sites, that offer very large image databases of fine art and cultural objects of artistic worth. All contain at least 2,000 online images, arranged in descending order by size of collection. 	The Library of Congress preserves vast quantities of artwork in the form of photomechanical and hand-press originals, as well as drawings. The Prints and Photographs Online Catalog page summarizes each collection [http://www.loc.gov/rr/print/catalog.html]. The American Memory digital collections [http://memory.loc.gov] can identify digital collections that feature printed artwork such as posters, and many digitized historic books and magazines also contain art illustrations. Don't miss the Global Gateway site for international and individual digital collections [http://international.loc.gov] and the Exhibitions page [http://www.loc.gov/exhibits/]. 	Scheduled for full public, free access in fall 2004, the New York Public Library's NYPL Digital Gallery [http://www.nypl.org/digital/digitalgallery.cfm] will feature "more than 400,000 digital images from NYPL collections, including illuminated manuscripts, historical maps, rare prints, and photographs." You can view a number of smaller art images collections now through the Prints & Photographs category of the Digital Collections page, or through the Mid-Manhattan Library Picture Collection Online of more than 30,000 images [http://digital.nypl.org/mmpco/]. 	Thinker ImageBase, Fine Arts Museums of San Francisco [http://www.thinker.org/fam/about/imagebase/index.asp], the largest public art gallery database in the U.S., contains over 85,000 images. The advanced search lets you search by keyword, artist, country, or time period. Except for the time period pick list, no controlled vocabulary searches exist until you get to the database record itself, where you'll find hyperlinked related keywords. 	The Cleveland Museum of Art's Ingalls Library's Image Catalog [http://library.clevelandart.org/public/copyright.html] describes a circulating collection of art images, some accompanied by thumbnails. According to the ARLIS/NA Visual Resources Division list of member databases, updated in March 2004, the image catalog describes 52,000 online images or 11 percent of the entire collection. 	The Los Angeles County Museum of Art (LACMA) Collections Online [http://collectionsonline.lacma.org] exuberantly advertises, "Explore 46,104 artworks (nearly half of our collection!)." Around 25,000 images accompany the database records. From the same county, the Autry National Center's Museum of the American West [http://www.autrynationalcenter.org/collections/] carries some (Wild) Western art. 	The Boston Museum of Fine Arts Collections Database [http://www.mfa.org/artemis/collections/index.htm] represents one example of several North American and European museums whose online collections databases incorporate detailed information, along with images of European art from areas occupied by Nazi Germany during World War II. You can access over 27,000 online images from the total database of around 30,000 records, which describe about 9 percent of the collection. 	As you might expect with two national art institutions, you'll find lots of online art at the National Gallery of Art [http://www.nga.gov]  search the entire collection of more than 106,000 objects and view images for over 5,600 objects  and the Smithsonian's American Museum of Art [http://americanart.si.edu/search/search_artworks.cfm], where you can search for more than 18,000 online images or 45 percent of the total collection. 	Seattle Art Museum [http://www.seattleartmuseum.org], Seattle, Washington. Search the permanent collection of more than 20,000 works with 12,000 (60 percent) linked images. 	The Metropolitan Museum of Art (New York) [http://www.metmuseum.org] features two outstanding databases of online images: the first, over 6,500 digital reproductions from the permanent collection, including "the entire Department of European Paintings and the entire Department of American Paintings and Sculpture," and the second, the Timeline of Art History, which ranges in time from prehistory to the present. 	The Minneapolis Institute of Arts [http://www.artsmia.org/collection/] provides keyword searching for over 5,000 digitized objects from its total collection of over 100,000 items that cover many different cultures over time and space. You can also use the collection guide and browse the 5,000 items by culture or medium. 	Operated by the Buffalo Fine Arts Academy (founded 1862), the catalog to the entire Albright-Knox Art Gallery [http://www.albrightknox.org] permanent collection offers thumbnail images for an estimated 3,000 objects. 	Opened in 1929 in Manchester, New Hampshire, as a result of a private bequest, the Currier Museum of Art [http://209.187.119.118/] contains an extraordinary collection of European and American art, with over 10,000 cataloged images. 	Olga's Gallery [http://www.abcgallery.com]. Started in 1999 by sisters-in-law Olga and Helen Mataev, it is especially strong in online images of European and Russian artists. Several indexes let you quickly locate galleries by artist name, artist country, artist by movement or school, or a complete index to all persons. Background resources such as artist biographies and thematic indexes relating to the depiction of religious themes in art are comparable to what you will find on some other private sites. 	Carol Gerten-Jackson's CGFA [Carol Gerten's Fine Art], A Virtual Art Museum [http://cgfa.sunsite.dk/index.html]. Started in 1996, it contains images you can browse by artist name, nationality, and time period. It also carries compiled biographical information for most, if not all, the artists. The author's opinions do not necessarily reflect those of his employer. 	ArtMagick [http://www.artmagick.com], which partially closed in early July 2004, was "a nonprofit virtual art gallery displaying [over 4,000] paintings from art movements of the 19th and early 20th centuries (for example, Symbolist, Pre-Raphaelite and Art Nouveau)." Some information was archived by the site owner. A sister site, P.R.B. : The Pre-Raphaelites [Brotherhood] [http://www.preraphaelites.info], will open some time in 2004. 	The Athenaeum [http://www.the-athenaeum.org], launched in 2001 and based on an earlier Tripod.com site by Chris McCormick devoted to the Pre-Raphaelites, contains over 15,000 online images contributed by users. 	Preraphaelites.com [http://www.preraphaelites.com], founded by Pre-Raphaelite fan Igor Bogdanov, capitalizes on the popularity of this highly romanticized imagery. You can search or browse for hundreds of images here. 	Great Britain  Arthur Hughes (1827-1910): ArthurHughes.com [http://www.arthurhughes.com] is devoted to this member of the Pre-Raphaelite Brotherhood and contains over 2,000 images. 	Great Britain  Dante Gabriel Rossetti (1828-1882): The Rossetti Archive: The Complete Writings and Pictures of Dante Gabriel Rossetti: A Hypermedia Research Archive [http://jefferson.village.virginia.edu/rossetti/index.html] documents the most famous member of the Pre-Raphaelite Brotherhood. 	Great Britain  William Blake (1757-1827): The William Blake Archive [http://www.blakearchive.org/], which includes thousands of this poet and artist's images, was awarded the 2003 MLA Prize for a Distinguished Scholarly Edition, the first ever for a Web site. As with the Rossetti Archive, this site is based in the U.S. and sponsored by some of the same organizations such as the University of Virginia's Institute for Advanced Technology in the Humanities. 	Netherlands  Vincent van Gogh (1853-1890): Van Gogh Museum [http://www.vangoghmuseum.nl), Van Gogh 2003 150 [http://www.holland.com/vangogh/], and the Vincent van Gogh Gallery [http://www.vangoghgallery.com], the last a private site, endorsed by the van Gogh Museum, by Canadian David Brooks. of posters through sites such as AllPosters.com [http://www.allposters.com], "the world's largest poster and print store," with 26,244 items in the Fine Arts category. The two largest commercial, multinational, historical art image agencies I came across are the Bridgeman Art Library [http://www.bridgeman.co.uk], founded in 1972, which serves Corbis, Getty Images, and Grove Art Online, and AKG-images (Archiv für Kunst und Geschichte [Art and History Archive]) [http://www.akg-images.com], a German agency founded in 1945. A quick advanced search in the Medium field of Bridgeman for "watercolour" revealed 14,280 hits, with "painting" displaying 58,860 items, and "drawing" a mere 71. Most of the database records include an image. AKG, which serves only business clients, offers over 150,000 digital images on a variety of topics, not just historical art. You can sample dozens of images through its online gallery. Art Resource [http://www.artres.com], "the worlds largest fine art stock photo archive," founded in 1968 by Columbia University's Dr. Theodore Feder, features "100,000 keyword-searchable fine art images" licensable for commercial use exclusively in North America from the some of the best art museums and galleries in the world such as the Louvre, the Tate, the Sistine Chapel, the Hermitage, the Smithsonian, and the Museum of Modern Art (New York). Saskia, Ltd. [http://www.saskia.com], founded in 1966 by art historian Dr. Ronald Wiedenhoeft, who also acts as the photographer, specializes in reproductions of fine art for educational use. You can browse its catalog of over 27,000 images by textbook set, image sets, artists, museums, countries or periods. Many other multimedia major commercial image agencies such as Corbis [http://www.corbis.com] and Getty Images [http://www.gettyimages.com] also contain images of posters and other kinds of commercial and fine art imagery. Among the fine art content suppliers to Corbis are the Italian Alinari Archives (Fratelli Alinari) [http://www.alinari.com], the Philadelphia Museum of Art [http://www.philamuseum.org], the Spanish Archivo Iconográfico [http://aisa-bcn.com] online search and 125,000 images available June 2004, and the National Gallery in London, England [http://www.nationalgallery.org.uk]. Since Corbis and other commercial image resellers often digitally watermark their images, you should also examine the national and academic art gallery resources separately, because you may find the same or other images available at higher resolutions and/or for free. These images, as is the case with the National Gallery, may also be watermarked. Fratelli Alinari also offers its own subscription-based educational site in Italian and English of 85,000 images of fine art and photographs [http://edu.alinari.it]. you search for "a small selection, of the thousands of images in our library...." Use the Google Directory or your local knowledge to find auction houses that specialize in fine art sales. Publishers of art history textbooks may offer a companion Web site. Two examples I encountered were the History of Art by H.W. Janson and Anthony Janson (6th ed. and rev. 6th ed., Prentice-Hall) [http://www.prenhall.com/janson/], and Marilyn Stokstad's Art History (2nd ed., Prentice-Hall) [http://wps.prenhall.com/hss_stokstad_arthistrev_2/]. Wadsworth, a publishing division of the Thomson Corporation, features a site devoted to the study of art history in its Arts and Humanities section [http://www.wadsworth.com/art_d/], with annotated art history links and a "Guide to Researching Art History Online." As actress Elizabeth Taylor discovered, all's not fair when it comes historic art and war. She launched a lawsuit in May 2004 to retain a van Gogh painting claimed by descendants of a German woman who once owned it, which Taylor's father bought for her at a 1963 Sotheby's auction. Since Taylor's lawyer's stated there's no evidence the painting was ever in Nazi hands, it's unlikely any of these databases will help her or the defendant's case. Operated by the Oxford Centre for Hebrew and Jewish Studies on behalf of the Commission for Looted Art in Europe, the Central Registry of Information on Looted Cultural Property 1933-1945 [http://www.lootedart.com] features an object database with "details of several thousand objects of all kinds from over 12 countries." A comparable effort in the U.S., the American Association of Museums maintains the Nazi-Era Provenance Internet Portal [http://www.nepip.org], which features a database of suspect cultural property, including Judaica items, from 105 museums in the U.S. Rather than providing images in its database, however, each record links to an institutional Web site. Several of the records stated that the institution had collection information online, so chances are you'll find an image online due to the intense effort underway to resolve ownership issues. Germany's Lost Art Internet Database [http://www.lostart.de], a federal and state government project available through German, English or Russian interfaces, documents both looted or stolen cultural objects and reports of rediscovered items. The Dutch Origins Unknown (Herkomst Gezocht) [http://www.herkomstgezocht.nl/eng/index.html] contains information on the unrepatriated Nederlands Kunstbezit-collectie (NK-collection, 2,641 illustrated database records), which consists of items looted by Germany from Holland during World War II. Finally, the Museum Security Network offers a long and very descriptive list of sites devoted to WW.II. and the Looted Art Problem [http://www.museum-security.org/ww2/index.html], along with direct links to the Google directory on World War II art thefts and provenance research. Falling between fine art and books, the beautiful, unique, hand-drawn manuscripts, associated in the popular imagination with European monks, have attracted the interest of many site builders. This short list of extraordinary collaborative and individual databases in Europe and the U.S. connects to thousands of images. The Digital Scriptorium [http://sunsite.berkeley.edu/Scriptorium/] at the University of California, Berkeley, brings together over 15,000 digitized images from more than 3,500 illuminated manuscripts and documents preserved in U.S. institutions. In addition to searching all contributing institutions, special searches are also available for the Huntington Library's collection of medieval and Renaissance manuscripts and images from selected Petrarch manuscripts in the U.S.
a joint project of libraries in Berlin, Marburg, and Munich, contains a union catalog of medieval illuminated and textual manuscripts in full color or black & white from German repositories, along with selected digital facsimiles of post-medieval published catalogs and inventories. The Ikcongraphic browser uses the ICONCLASS classification system, the same tool used by Foto Marburg's Bildindex der Kunst und Architektur, and many other European art history collections. The Enluminures database [http://www.enluminures.culture.fr] contains 14,000 selected images from 1,2000 illuminated manuscripts preserved by France's public libraries. Some libraries, such as the Bibliothèque Municipale de Lyon, also offer access to their own holdings; its la base Enluminures [http://www.bm-lyon.fr/trouver/basesdedonnees/Collections-numeriques.htm] contains 12,000 images from 457 illuminated manuscripts dating between the 5th and 16th centuries. The Koninklijke Bibliotheek (National Library of the Netherlands) Medieval Illuminated Manuscripts database [http://www.kb.nl/kb/manuscripts/index.html] demonstrates the full power of the ICONCLASS system, which you can use to browse the collection of about 10,000 images from 400 or so manuscripts, nearly the entire collection. to illuminated manuscripts I've come across. In some of the well-known search engines and specialized image search engines, I tried a search of "van gogh" (with and without quotation marks) and image search options; some of these sites also support simultaneous, multimedia searches (audio, still, and video images). You may get different results with and without quotations surrounding your search terms. The results column contains query results for queries with quotation marks ("19,089") and without quotation marks (19,222).